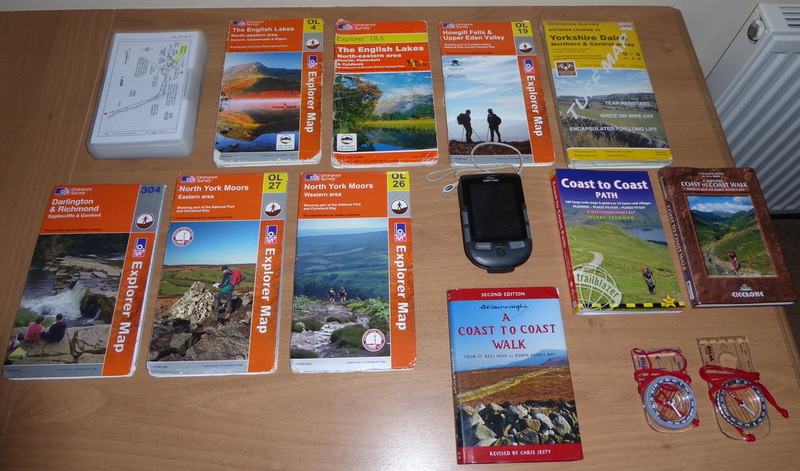 After completing the Pennine Way last year we had several irons in the fire as to what Long Distance Path to do next. We had enjoyed the Coast to Coast so much in 2012 that we were itching to do it again - plus our dog Fudge had not done it. Therefore after much discussion we decided to make a second crossing. Planning commenced in earnest roughly 9 months before and we immediately started looking at accommodation options, this time made more difficult as we had a dog. We intended to stick roughly with the itinerary we used in 2012 only this time we would dispense with rest days. The late Alfred Wainwright, Illustrator, Artist and perhaps the greatest ever fell walker, devised the route in the early 70s. Starting at St Bees on the West Coast of England and finishing at Robin Hood’s Bay on the East Coast, it is an extremely popular route and at 190 or so miles, is physically demanding. The route passes through 3 National Parks – The Lake District, Yorkshire Dales and the North Yorkshire Moors. This time we would be walking for 2 charities - The Bracken Trust which is a local Cancer Charity near our home and Spaniel Aid which provides a rescue, fostering and rehoming facility for all Spaniels. They are both excellent charities and it is hoped we can raise a fair bit of cash for them. As in 2012, we utilised a good excel spreadsheet with everything detailed on it from costings to B&B website links, kit and itinerary. I can e-mail a copy of this to anybody that requires it – it certainly worked for us. Again as in 2012 we used the Sherpa Van Accommodation page and Trip Advisor for our research which proved invaluable. Reading other walker’s comments gave us an idea as to whether the B&B would be suitable or not. Because it is an extremely popular route, we started booking the B&Bs immediately in September 2015 and even then some of our first choices were already booked up. Be prepared to chase B&Bs up for replies and deposit requests/confirmation of receipt. Additionally, about 2 months before you go it is a good idea to ring round again to confirm your booking. As stated above, due to unavailability at Danby Wiske, Bev at Park House, Ingleby very kindly provided a pick up/drop off service from Danby Wiske. This will enable us to have a 2 day stay with her. Also at Blakey Ridge we could only book B&Bs off route but Michael the owner very kindly provides a pick up/drop off service. Do not be alarmed if you cannot get a room in a B&B exactly on route – ask if any arrangements can be made to pick you up and drop you off the next day. It is also advisable to gauge what time you will be able to have Breakfast as this will aid your planning, particularly where you have a long day ahead of you. Additionally, make a note of check in times - some B&Bs do not like you turning up too early. As with 2012, this time we utilised Packhorse to take care of our baggage transfer, our transport to/from the start/finish and car parking in Kirkby Stephen. As of 2016, they are now under new management and hopefully they will still be a professional outfit that are well used to the demands of walkers on this popular route. Whilst we organised our own accommodation, they will do this for you, however you can save yourself a bit of cash if you start your planning early enough. You are walking long distances each day therefore it pays to have a modicum of fitness in order to make the journey as pain free and pleasurable as possible. We walk a lot therefore consider ourselves walk fit but it does pay to get used to a long walk day after day - this can easily be achieved over weekends etc. Additionally, keep the body used to exercise on a daily basis - we have a spinning bike and use that to increase CV and stamina. It also helps to do various stretches (hamstring, calf, quads, groin etc) at the beginning and end of each walk - most people don't. The most important aspect of any long distance walk is how you look after your feet. We have a regime for any walk we do and that is on a daily basis to tape up any areas of your feet which have suffered blisters/rubbing in the past. Use a micro porous tape to protect each area. Additionally, once taped up, smear vaseline around the sole of the feet and in between the toes - it really does make a difference. During the walk it is important to air your feet and let them breathe out of the boots - you may also wish to change your socks, particularly on the longer days - on the days we did this then we applied a soothing foot spray too. In the evening and after a bath/shower you can also apply some Peppermint Foot Lotion which will soothe aching feet. As for your Boots, it goes without saying that they must be comfortable and worn in - whatever you do, do not turn up at St Bees in brand new boots. Take a pair of spare laces too and a boot cleaning kit. Trying to be pragmatic about how much to take is very difficult. Suffice to say that in our daily luggage will be some handwash and we are hoping for areas to dry stuff – end of!! As far as medical and first aid kit we have everything from painkillers to Immodium plus a fair amount of Compeed. It goes without saying that by Day 10 we will be sick to death of a Full English every morning. Suffice to say, like 2012 we are hoping that some B&B owners will have other options rather than a big fried Breakfast. We intend to snack during the walk itself therefore will be taking the usual stuff - Flapjacks, Jelly Babies, Wine Gums etc plus 2 litres of water each - additionally we have investigated and identified places where we can top up our water should that be necessary. As for evening meals, we have booked a table at most stops. So there we are – with just over a week to go we are both ready and willing to take on this fantastic walk - again.